Composite bonding also known as tooth bonding is a popular option in the field of cosmetic dentistry. Composite bonding is done in many cases in the dental patients who want to improve their smiles permanently. Decayed teeth can be successfully repaired with the help of the composite bonding where the composite resins are used to fill the cavities. Discoloured teeth can be whitened to a great extent by the dentist with the help of the composite bonding. Chipped teeth can also be treated with the help of the composite bonding procedures and the results are appreciated by the patients. The shape of the teeth can be modified in the patient’s mouth by using the composite resins and bonding them to the teeth. In this way, the teeth size also increases which provides a new and more attractive look to the patients who are looking for the various aesthetic options. The best part is that the composite bonding is tooth coloured and therefore most of the aesthetic problems are solved here itself. 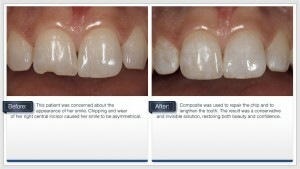 The cost of the composite bonding is much less than most of the other treatments in the field of cosmetic dentistry. The most well-known advantage of composite bonding is that it can be done in 30-60 minutes in a single appointment itself. The ultraviolet light or lasers are used in the dental practices to harden the composite resin on the teeth. The natural tooth removal is much less in the composite bonding procedures which is of great benefit to the patients. Anaesthesia is not required in the tooth bonding procedures unless and until it is done to fill a cavity in the patient’s mouth. In this way, composite bonding provides many benefits to the patients who want to get their smiles improved for a long period of time. Therefore, the patients can truly appreciate the work done by their dentists with the composite bonding.